Prestigious beauty brand, L’Oreal Paris facilitate the Pakistan Fashion Design Council (PFDC) to organized a four-day bridal week started on December 18th to 21st December. 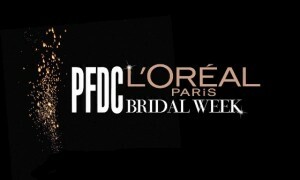 In a four-day PFDC L’Oréal Paris Bridal Week 2012, three jewellery designers, five make-up artists, and twelve fashion designers participated at all. Each day, three fashion designers, one makeup artist, and a jewellery designer demonstrated their guts and trends. PDFC L’Oreal Paris bridal week 2012 meant to draw inspiration for future trends for bridals in new year of 2012 with the help of fashion designers, makeup artists and jewellery designers. Each day of PFDC L’Oréal Paris Bridal Week is being styled by a different creative team. PFDC L’Oréal Paris Bridal Week each day was attended by celebrities, media, the fashion fraternity and stockiest such as the Manchester based Imani Studio and the Pakistani based Ensemble. Here are the four days PFDC L’Oréal Paris Bridal Week Pictures.